A-HOTEL.com - Luxury and cheap accommodation in Bor, Russia. Prices and hotel, apartment booking in Bor and surrounding. Set on the beachfront in Zaruchevie, Pansionat Zaruchevie features a private beach area. With a seasonal outdoor swimming pool, the property also has a garden. Отдых на Селигере is located in Kazakovo. All units come with a living room, a seating area with a sofa, a flat-screen TV with satellite channels, a fully equipped kitchen and a private bathroom with shower. 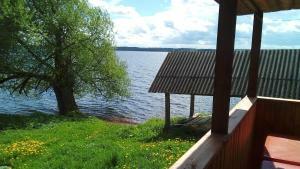 Vacation Home Seliger is set in Kazakovo and offers a private beach area, barbecue facilities and a terrace. With lake views, this accommodation offers a balcony. With lake views, Holiday home in Zavirye is situated in Zavir'ye and has accommodation with a kitchen. Fitted with a terrace, the units feature a flat-screen TV and a private bathroom with shower. Set in Lanino in the Tver region, Дом на Селигере, оз Волго features a garden. It has barbecue facilities, garden views and free WiFi. Boasting a sauna, Сдаю дом в турбазе Чайка на Селигере is located in Lanino. Guests staying at this apartment have access to a fully equipped kitchen. Situated 6 km from Selishche village, Holiday Home in turbaza Chayka-Seliger offers a barbecue, children's playground and terrace. Free private parking is available on site. Facing the beachfront in Lanino, Room in tur baza Chaika features a garden. The rooms are fitted with a flat-screen TV with satellite channels. Located in Lanino, Tourbaza Chaika offers accommodation with access to a garden. The accommodation has a hot tub. Сдаю дом на Селигере с баней is situated in Koshelevo and offers barbecue facilities, a garden and a terrace. Guests staying at this holiday home have access to a fully equipped kitchen. Featuring ski-to-door access, Guest House near t/b Chaika is set in Ostashkov and also provides barbecue facilities and a garden. Boasting a 24-hour front desk, this property also provides guests with a restaurant. Set in Khotoshino, Дом на Селигере у озера offers accommodation with private terraces. Among the various facilities are ski-to-door access, a private beach area, as well as barbecue facilities. Mini Hotel Green Gold Park is located in Selishche. Boasting babysitting service, this property also welcomes guests with a restaurant and a terrace. Hotel Volga is located in Selizharovo Village, a 3-minute walk from the Volga River Embankment. Free WiFi access is available. Located in Selizharovo, Cottage in Kubyshkino features barbecue facilities and garden. All rooms boast a kitchen and a private bathroom.